United States District Court for the Southern District of New York (2015). My experience with Aisha was very satisfactory. I was very nervous about the 'lawsuit' but Aisha was able to put my mind at rest. Thank you for all your attention with us... Very professional work, especially on your communication with us either by phone or letters. I will not hesitate to recommend Powell & Roman to anyone. A very special thanks to Aisha Farraj. Aisha was unbelievably helpful when I pursued a case against my league, after sustaining a preventable injury. She was extremely thorough when researching the components of my case and proved to be extremely knowledgeable in what paths to take to reach a favorable outcome. She was always available and worked around my schedule, which was a huge help due to my case being time sensitive. Aisha is extremely clever in how she approaches her work and I highly recommend choosing her as your lawyer. 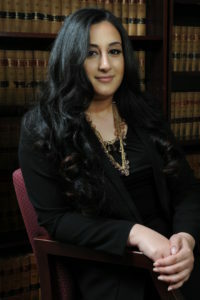 Aisha Farraj handles insurance defense and coverage litigation, intellectual property matters, and commercial litigation and transactions. Ms. Farraj is a graduate of Seton Hall University School of Law, where she concentrated her studies in Intellectual Property Law. During law school Ms. Farraj served as an Extern to the Honorable Martha T. Royster, Superior Court of New Jersey – Civil Law Division. In addition, Ms. Farraj has been recognized for her commitment to public service for her work through Seton Hall Law’s award-winning Pro Bono Service Program. In the Spring of 2016 Ms. Farraj was on secondment in the London insurance market working with a leading Lloyd’s syndicate, handling a variety of U.S. claims, including homeowners liability, commercial property, and professional liability. During her secondment she was involved in the various phases of claims processing, including coverage analysis, claims investigation and adjustment, resolution strategy and litigation review and oversight. Ms. Farraj’s work on secondment has given her invaluable insight into practical day to day claims operations of the London market and its interaction with the various participants in United States surplus lines insurance market.